Data transactions (email contact form, registration, login, data entry) executed through this website are encrypted using 256 bit Secure Socket Layer (SSL). Secure Socket Layer (SSL) is the standard security technology for establishing a secure encrypted connection between a web server and a web browser (such as Chrome, Firefox, Safari, Internet Explorer, Opera). 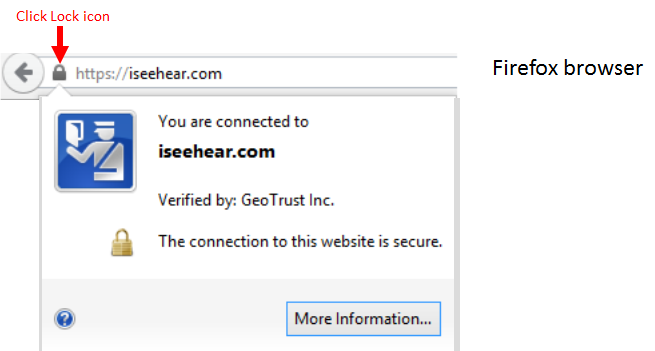 The Iseehear.com website uses Secure Socket Layer (SSL) encryption which has been verified by RapidSSL and GeoTrust Inc. (RapidSSL and GeoTrust Inc. are both subsidiaries of Symantec Corporation). Data transactions (email contact form, registration, login, data entry) executed through this website are encrypted using 256 bit Secure Socket Layer (SSL). 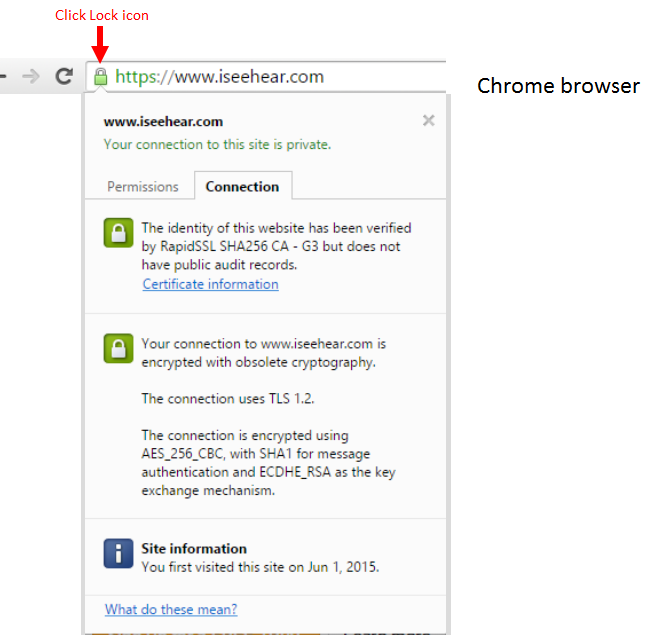 To identify if a website is using SSL look for the lock icon and https in the address bar (see Image #1-A and Image #1-B). The address bar for this website should read: "https://iseehear.com" or "https://www.iseehear.com" (see Image #1-A and Image #1-B). Important: If the "home page" address of this website is not written exactly as either "https://iseehear.com" or "https://www.iseehear.com" then do not enter any data and please notify Iseehear Inc. immediately. If the Iseehear contact information does not correspond to the information on this page, please abandon this website and contact Iseehear immediately.